I grew up in a semi-rural community near a much larger city. The schools – elementary school, junior high, and high schools were clustered together on the same campus. It was shortly after WWII, and our cafeteria was an old converted army building. We ate from army surplus steel trays, and the food was almost all surplus commodities including cheddar cheese, ground beef, eggs, and lots of ground beef. In those days there were honest-to-goodness “lunch ladies” who actually cooked from scratch instead of opening a package and slipping it into a microwave. Most of the women were mothers of friends and classmates (In fact, my mother was a lunch lady at a nearby school). They knew how to cook homestyle food, and they clearly loved their work. The kids all loved their work, too – spaghetti and meat sauce, macaroni and cheese, grilled cheese sandwiches ( a lot of surplus cheese in those days), freshly baked hot rolls or cornbread every day plus milk and a sweet dessert like apple pie. The price was right, too: 25 cents. About once a month the lunch ladies prepared a special treat, hamburgers with all the trimming along with homemade potato chips (potato crisps for my UK friends) still hot from the deep fryer. On those days the crowds of hungry kids were enormous. I thought about that memory the other day when I wondered to myself, “How hard can it be to make homemade potato chips?” The answer is, “Not hard at all.” The hard part comes in cleaning up the kitchen, especially if you are a messy cook like me. The hot oil splatters all over the place, paper towels used for draining get soggy and greasy, and accidental spills seem unavoidable. Still, homemade potato chips taste so much better than the commercial kind that there is no comparison. 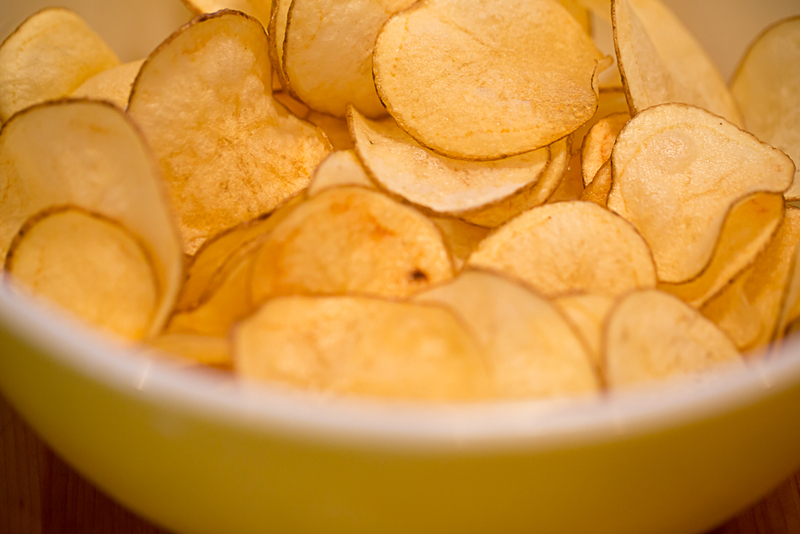 You can’t just sit down and eat nothing but a batch of fresh potato chips. (Actually that’s not true; I know I can.) So you need to have a menu. 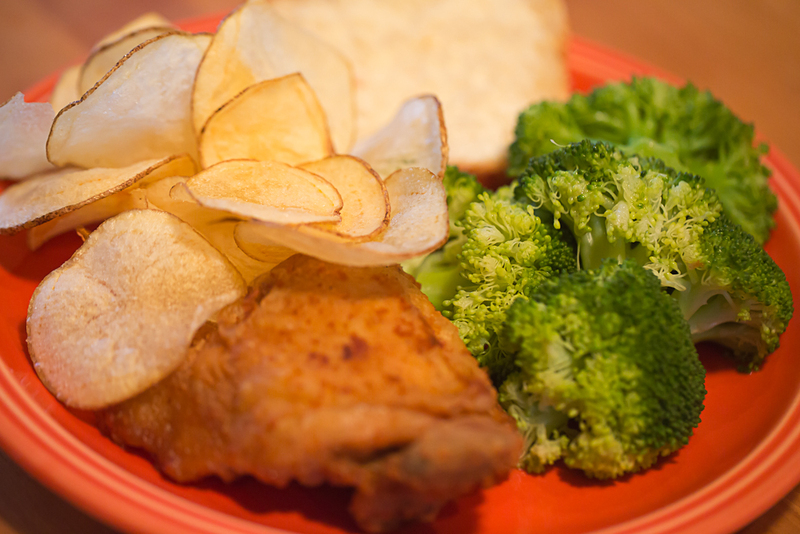 I served the chips with fried chicken and broccoli. That only reinforced my memories of school days. Cover the potato slices with water and soak until you are ready to cook. In a heavy frying pan with tall sides (cast iron works great), pour in oil to a depth of 1 to 2 inches. Heat to 375°F. If you don’t have a deep fry thermometer, heat until the surface shimmers. 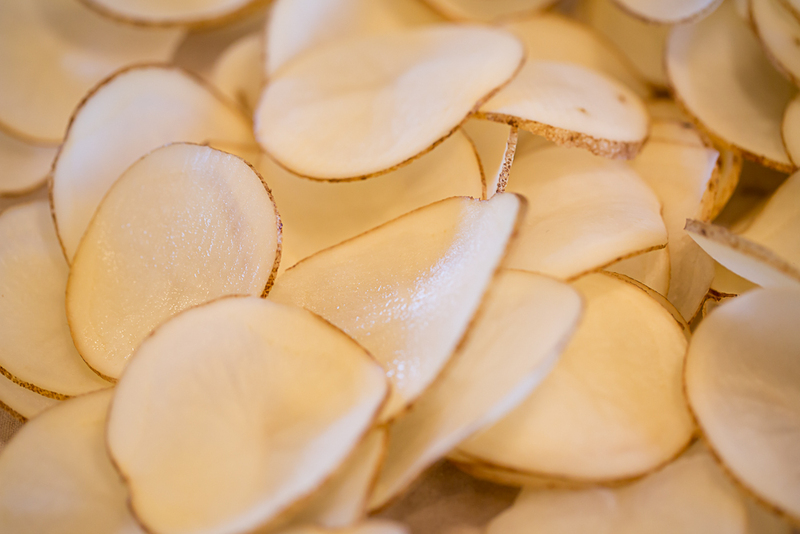 While the oil is heating, drain and dry the potato slices as well as you can. Residual water will make the hot oil flare up when the potato slices are added. Serious burns can result. 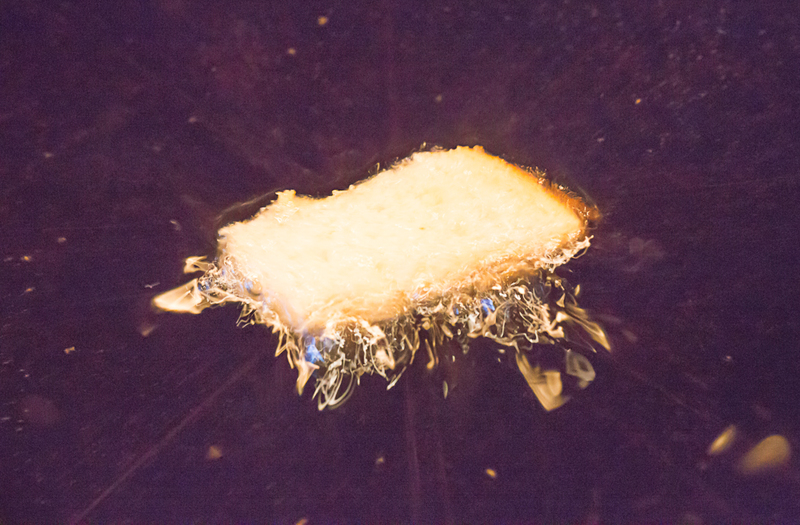 You can test the heat of the oil, either with a cube of bread or one of the potato slices. Bubbles should rise immediately, and the sample should brown in a minute or so. Add the potato slices, a few at a time, to the heated oil, being careful not to burn yourself. Watch to make sure the oil does not boil over. 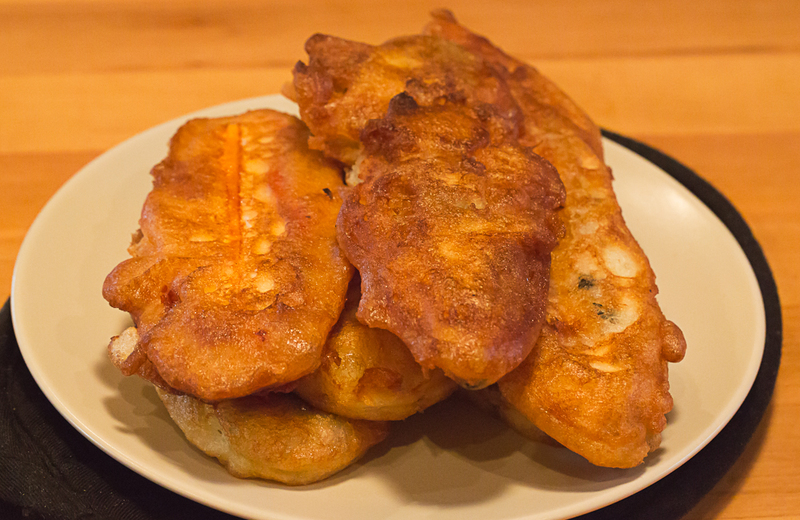 Stir the slices gently while frying so that they don’t stick together. When the bubbling has subsided and the underside of the slices are the desired color, turn them over, finish frying them, and then remove them to multiple thicknesses of paper towelling to drain. While the fried chips are draining, lightly salt them. As you continue with more batches, transfer the finished chips to an oven-proof bowl in the middle of an oven preheated to 200°F. Serve when all the chips are fried. Visitors to Santa Fe usually think of it as a visual place: the clouds and mesas that so enchanted Georgia O’Keeffe, the ancient adobe buildings around the Plaza, and the color of a fiesta. There are also sounds: the quiet of a December snow, crashing thunderstorms in the middle of summer, and the calls of geese and cranes flying overhead in the spring and fall. But Santa Fe is every bit a place of wonderful smells: lilacs pushing over an adobe wall in the springtime, the smell of a winter’s piñon fire burning in a fireplace near the Plaza. 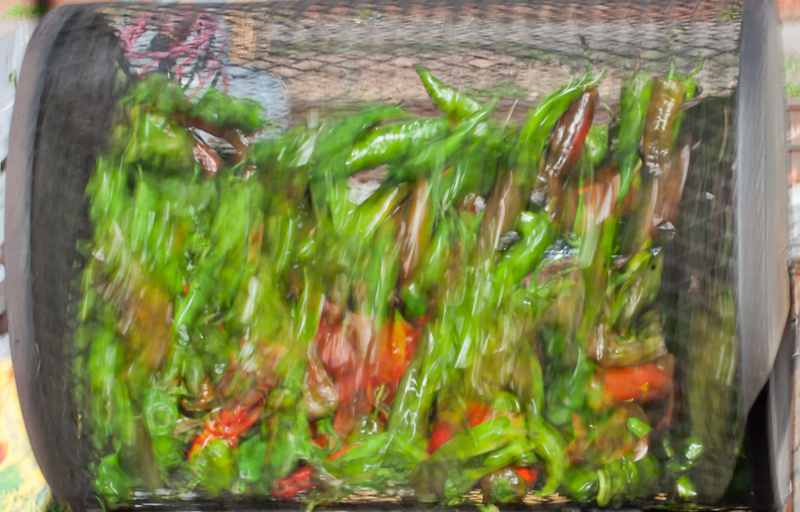 This time of year, the smell is of green chiles roasting. It is a fragrance like no other, and once you experience it, you never forget it. 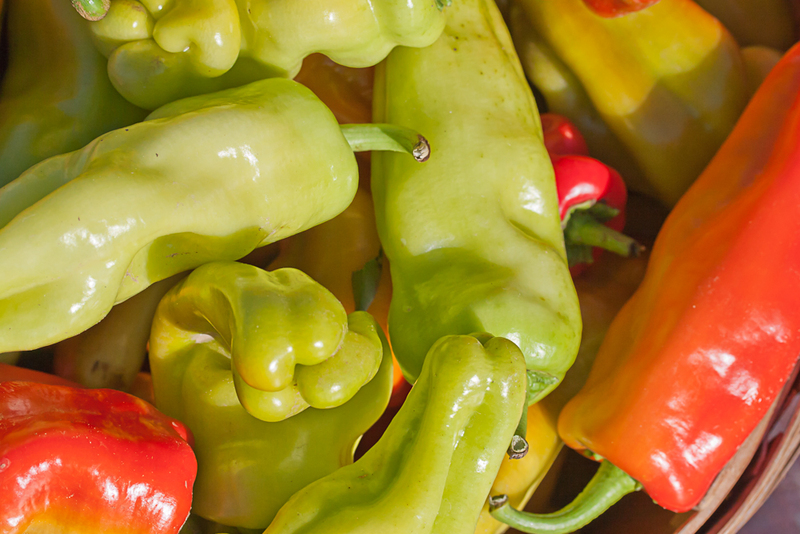 Chiles have been growing during the hot summer throughout the state. Perhaps the most famous chile crop comes from Hatch,, but there are also bountiful sources in Chimayó and Socorro along with many a back yard. When the chiles are ready for harvest, they are loaded into big gunny sacks and taken by truck all over the state. 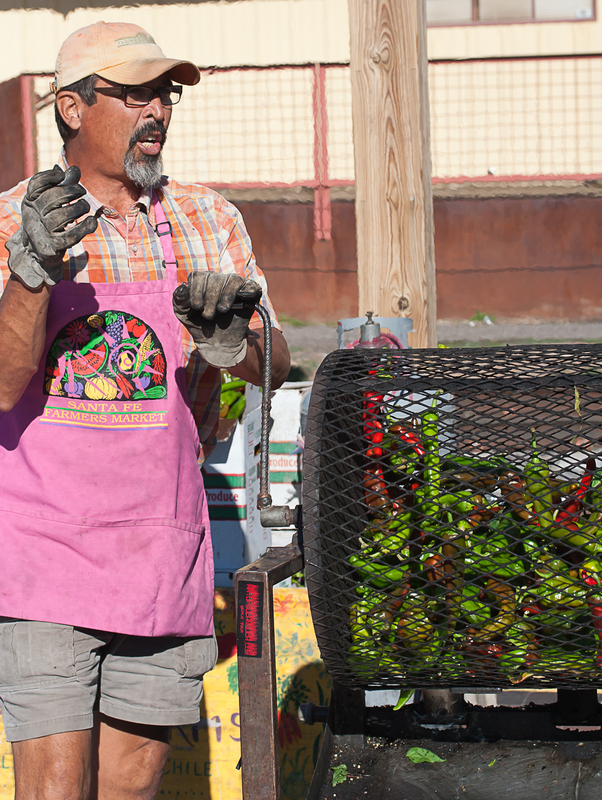 In Santa Fe, growers set up stalls throughout the city where they roast the green chiles on the spot in a revolving metal mesh drum over a blazing butane flame. 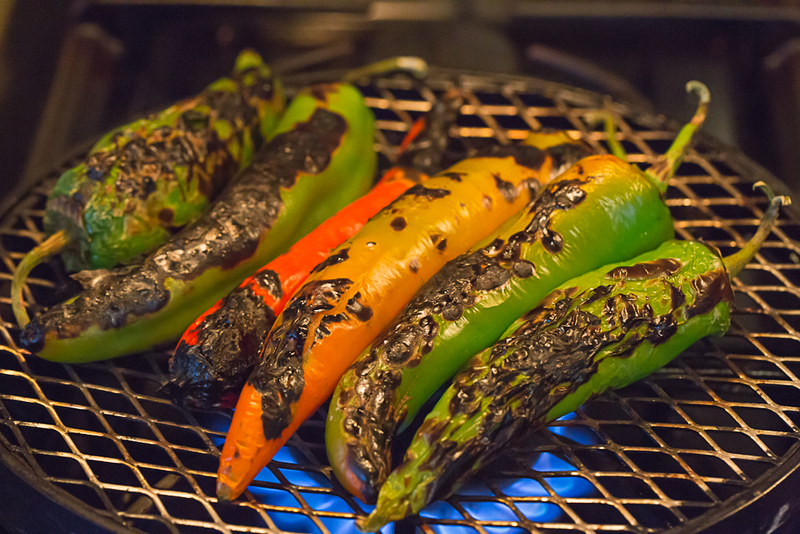 The tough outer coat of the chiles is charred in the process so that it can be peeled off in preparation for cooking. The roasting creates a pungent, unmistakable smell that fills the air. The farmers market also boasts chile roasters who make the festive environment even more vibrant. The buyer can get a whole gunny sack full of roasted chiles or even a small plastic bag. Then the task is to take them home, peel off the charred skin, and either cook or freeze them for the winter ahead. 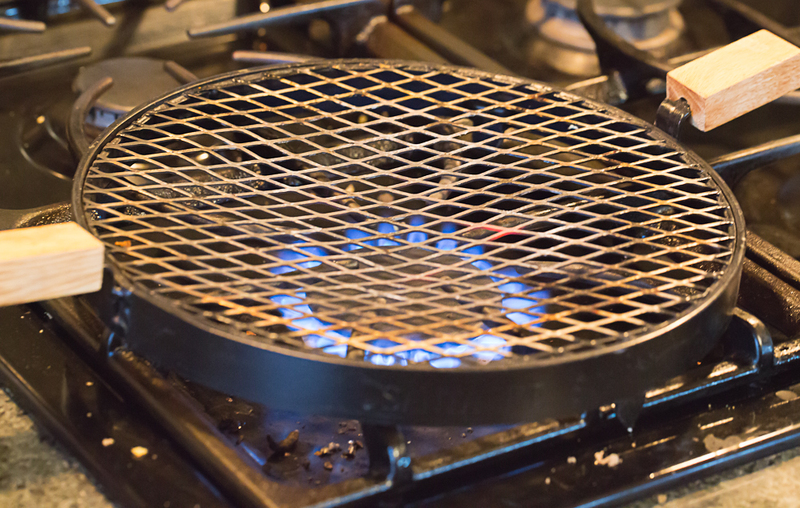 If you don’t need a green chile supply for the whole winter, you can even do them yourself on the barbecue or, better yet, on a special device made of metal screen and designed to sit over a gas flame. The device is indispensable for the Santa Fe cook. One can be ordered from the Santa Fe Cooking School. 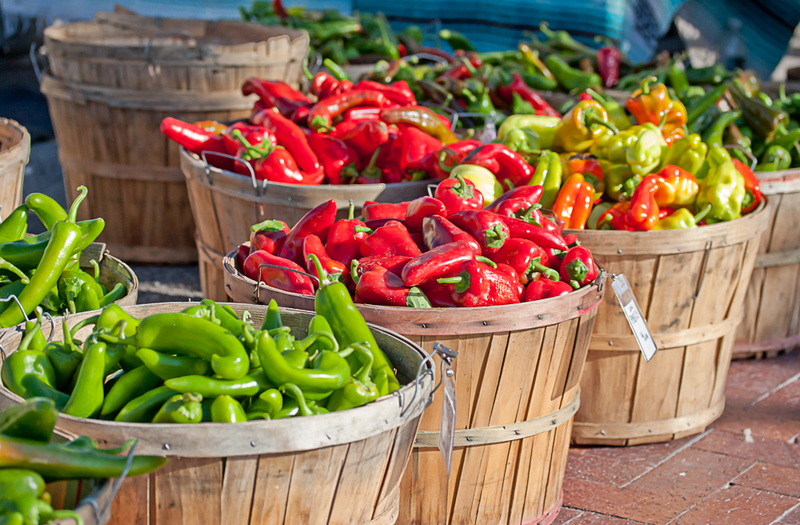 Green chiles wind up in just about every Santa Fe dish you can think of, including ice cream, but probably the most popular dishes are green chile stew, green chile cheeseburger, and my favorite, chiles rellenos. Making a chile relleno is an act of love because the preparation takes a lot of steps, and the chiles have to be eaten immediately. 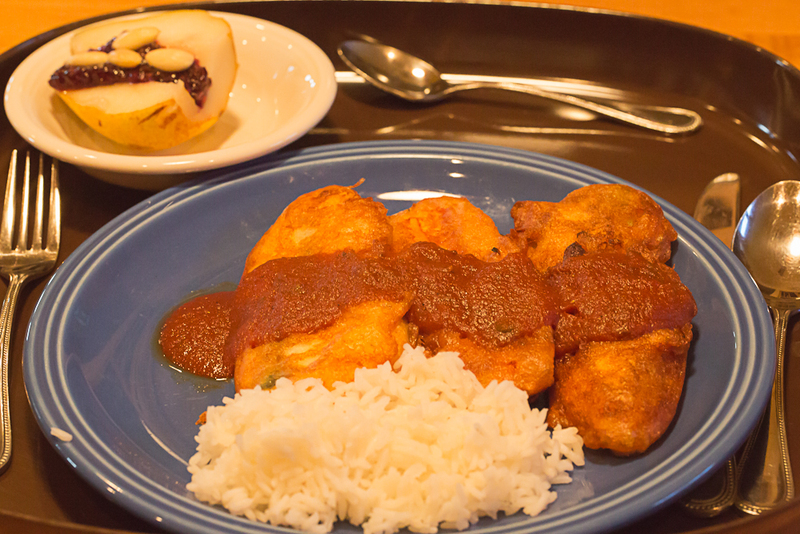 A leftover chile relleno is a soggy shadow of its former self. Still, they are worth the effort, especially when they are covered with a fresh salsa roja. Here’s how you do it. Purchase roasted chiles or roast your own on a chile roasting pan over a high flame, a very hot barbecue grill, or in the oven under the drill. Turn frequently until all sides of all chiles are heavily charred. 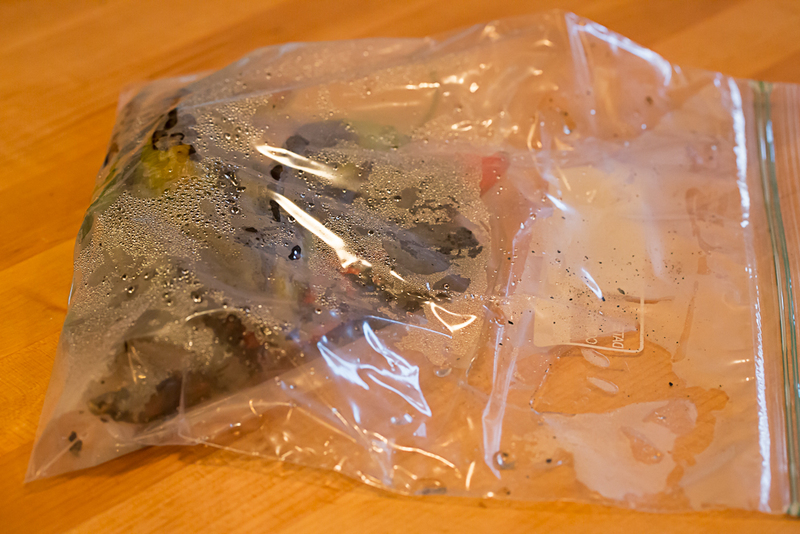 Immediately place the chiles in a plastic bag and allow to cool. Then remove the chiles from the bag, and under running water peel the charred skin carefully so as not to tear the flesh of the chiles. Cut off the stems of the chiles, pull out the seeds and inner membranes using your fingers. Rinse out the chiles to remove any loose seeds. 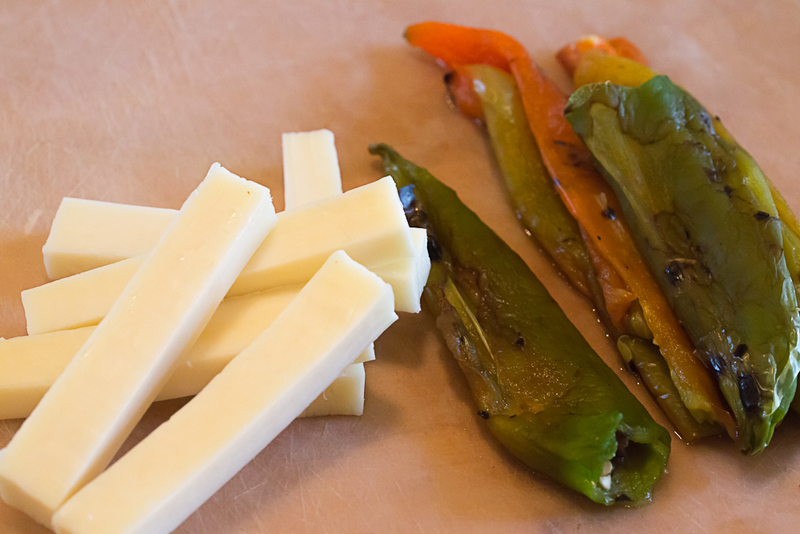 Gently stuff each chile with one of the pieces of cheese and set aside on paper towels. In the meantime, prepare the batter by combining egg yolks, milk, flour, salt and vegetable oil using a rotary egg beater. 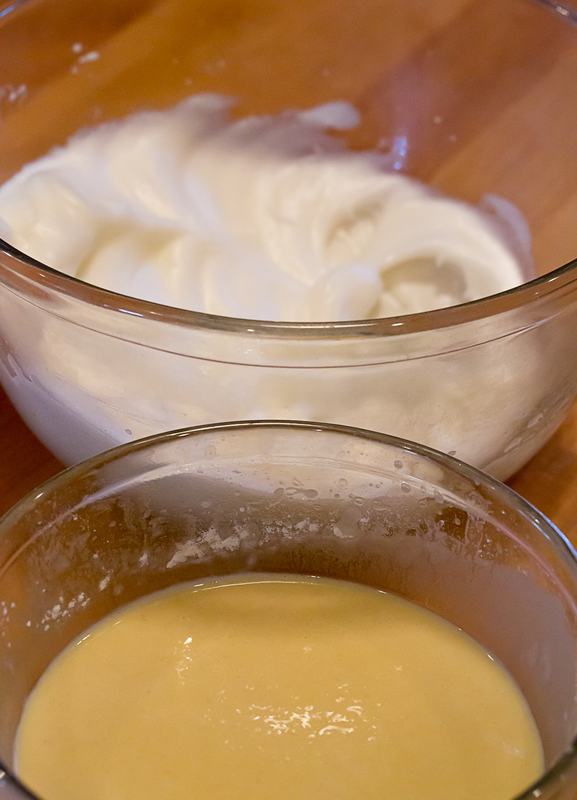 Let the mixture blend for 30 minutes while you whip the egg whites until they form stiff peaks. Gently fold the yolk and milk mixture into the whipped egg whites until well combined. Dredge each prepared chile into flour. Then dip the chiles individually into the combined batter. While preparing the chiles, pour enough peanut oil into a deep-sided heavy pot (A cast iron skillet works well) and heat to 375°F. One at a time, place the batter-coated chiles into the hot oil. Cook no more than two at a time. Otherwise the chiles may stick together. 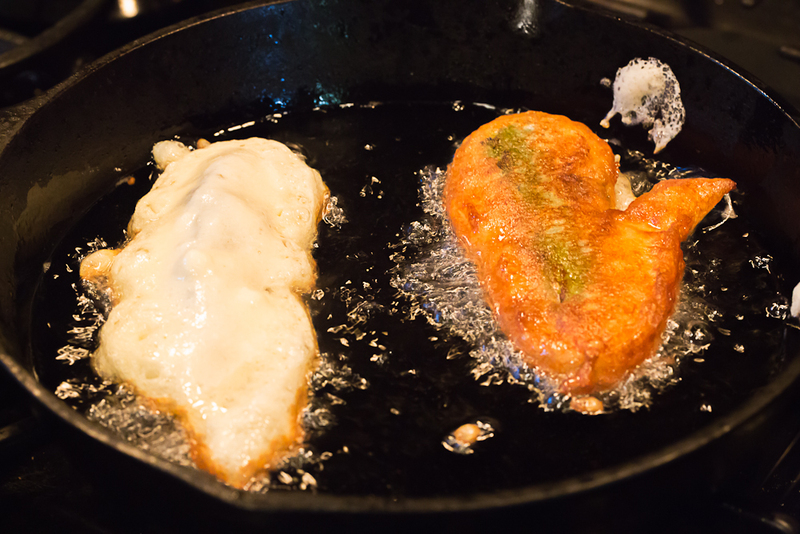 Turn the chiles when well browned on the bottom and finish frying the other side. Remove from the hot oil and drain on layers of paper towels. 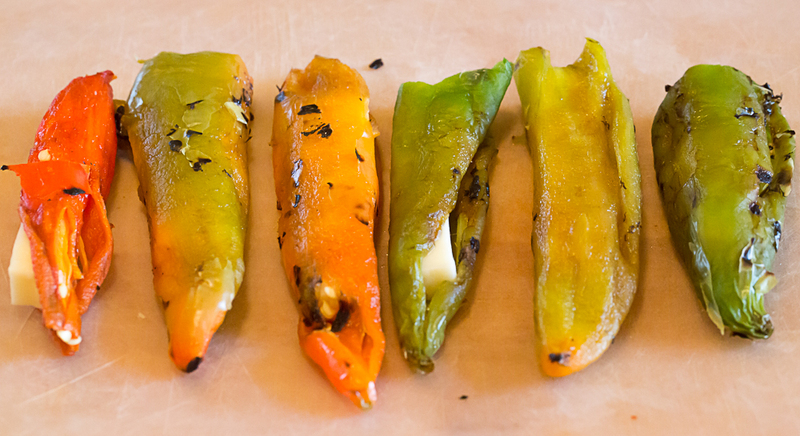 Keep the finished chiles on a plate in an oven heated to 200°F until all of the chiles are fried. Serve immediately. Otherwise they may get soggy. Add rice and/or beans (refried or other) if you desire. I finished the meal with rice and a fresh pear-half filled with green chile flavored raspberry preserves (no kidding) and blanched almonds. A few weeks ago, I bought a loaf of potato-sesame bread from a baker at the local farmers market. It had a nutty flavor, and the crunch of the sesame seeds gave it a unique bite. While waiting in line to pay, I heard the baker tell another customer that the bread was the first he learned to bake when he was in a monastery many years ago. Later I bought another loaf of the same bread. It had lumps of whole potato – not nearly as good as the first loaf. That made me think that I wanted to bake my own version. I looked in vain for a recipe. There were lots of breads made with potato water, some made with potato sourdough starter, some with instant potatoes, and several with potato flour. There were none with mashed potatoes, which sounded to me like a good beginning. Then I thought, “monastery – bread”. The only connection I could make was the classic baking book by Edward Espe Brown called The Tassajara Bread Book, Shambhala Publications, 1970. I checked my copy, and sure enough there were recipes for sesame bread and potato bread using mashed potatoes. There was no recipe for potato-sesame bread, though that was alright because I had already begun to work out my own version. The recipe follows. It is an easy bread to make, with a fine crumb and a chewy crust from the enrobement of sesame seeds. Since potatoes contain no gluten, I have added gluten powder to promote rising and good texture. In a medium saucepan over high heat, put the cubed potatoes in plenty of water to cover and bring to a boil. Continue to boil the potatoes until they are done and a sharp fork pierces them easily, about 30 minutes. Do not add salt to the boiling water. When the potatoes are done, drain them, reserving 2 cups of the potato water. Pass the drained potatoes through a potato ricer or food mill and set aside. There should be about 2 cups of mashed potatoes. Let the potato water cool enough that it is warm but not hot. In a large ceramic bowl, combine 2 cups of potato water with sugar. Stir until the sugar is dissolved. Then sprinkle the dry yeast on the surface of the mixture and let stand for 5 minutes. Then stir so that the yeast is dissolved. Stir in the salt, melted butter, and gluten until well combined. One cup at a time, stir in 3½ cups of flour, combining thoroughly after each addition. Knead the dough in the bowl for about one minute. Then turn out onto a flat surface covered with the remaining one cup of flour. Knead for about 10 minutes until the extra flour is incorporated and you have a smooth dough. The dough should be sticky. This will make it difficult to work with, but too much flour will make the finished bread too firm and tough. Form the dough into a ball, lightly oil the surface, and place it in a covered clean bowl or bread-proofing box. Let rise in a warm place until the dough is doubled, about 2 hours. Punch down the risen dough and let rise a second time until doubled, about 1 hour. Divide the dough into two equal portions. Shape each into a ball and place in a shallow pan or dish of sesame seeds. Sprinkle additional sesame seeds on the top of each round until completely covered with the seeds, and shape into a rough loaf. 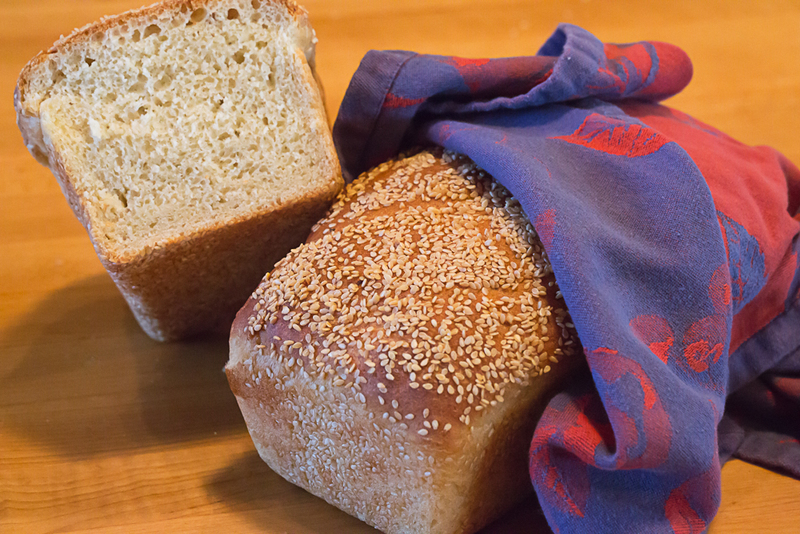 Place each shaped, sesame-coated loaf in a well-greased 8½ x 4½ inch bread pan. Cover with a clean cloth and let rise for about 30 minutes. In the meantime, preheat the oven to 375° F.
Bake the loaves in the middle of the preheated oven for 45 minutes. Test for doneness by thumping the bottom for a clear sound. Turn the finished loaves onto a cooling rack and cool. Our family birthday celebration was a multi-day affair with the culmination being dinner for all of the adults at Rich Table. In the meantime we had other meals together, and our other daughter, Carol, had volunteered to cook for children and adults on the night before the party. In spite of similar premonitions, Carol took on the challenge and prepared a wonderful meal that everyone enjoyed. There was nothing left. Shortly before dinner time, Carol went shopping at the local farmers market and a grocery store. She brought home some beautiful heirloom tomatoes, fresh basil, home-made mozzarella in little balls, raw shrimp, and fresh mushrooms. 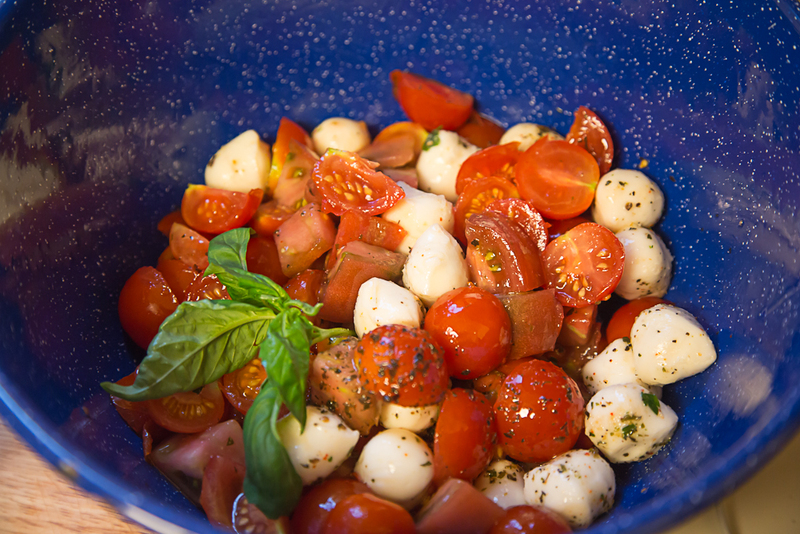 The first course was a sort of caprese salad made from the variously sized tomatoes, mozzarella balls, fresh basil, balsamic vinegar and olive oil. 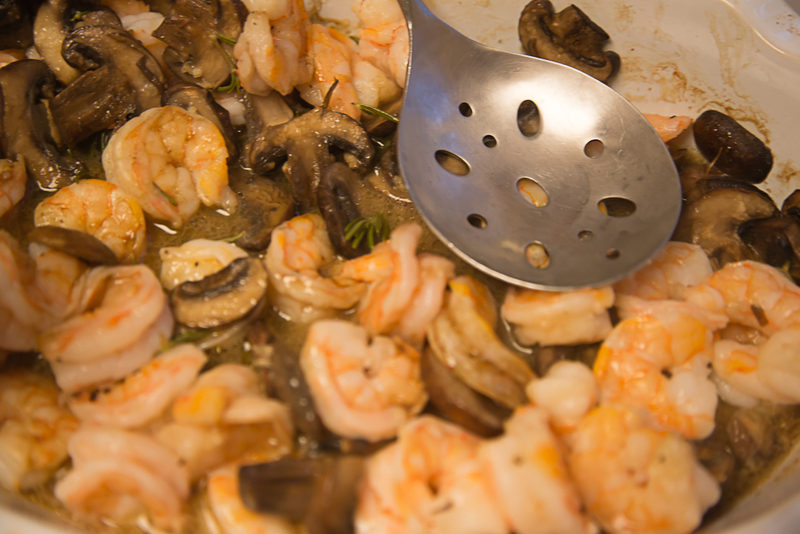 For the main meal, Carol cleaned and shelled the shrimp with a little help, cleaned and sliced the mushrooms, and began to cook. I forgot to mention she melted a half pound of butter. Then she guessed at the amount of couscous, erring on the high side since both pasta-lovers and pasta-haters averred to liking couscous. 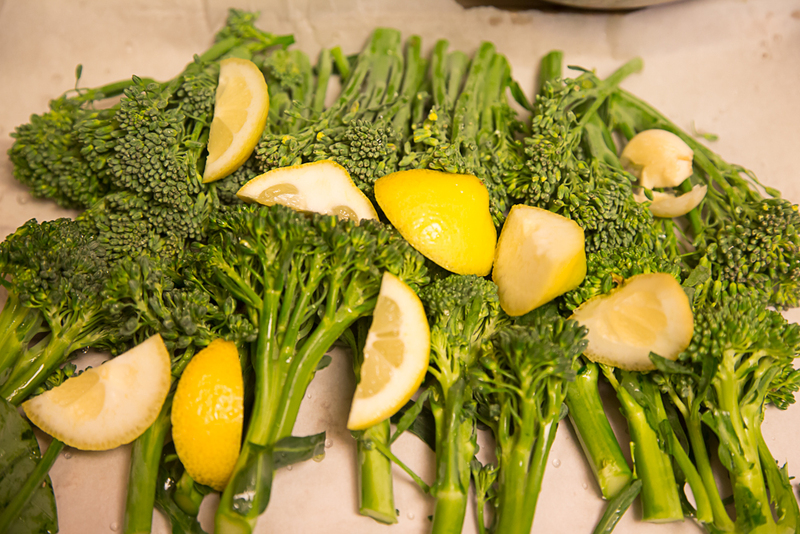 She served this with a side dish of broccoli roasted in butter, lemon, and garlic. Things were cooked up in a flash, and before anyone could even think of complaining about being hungry, the meal was on the table. There was enough food for seconds, and soon dinner was over, plates were clear, and the serving bowls were empty. That’s what I call success. 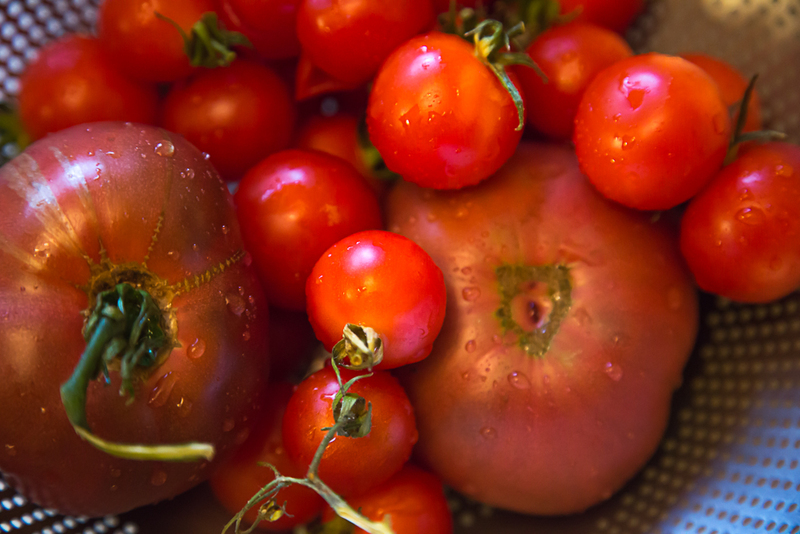 Wash and cut the tomatoes into large chunks. Leave cherry tomatoes whole. Clean and slice the mushrooms. Set aside. Peel and clean the shrimp. Set aside. 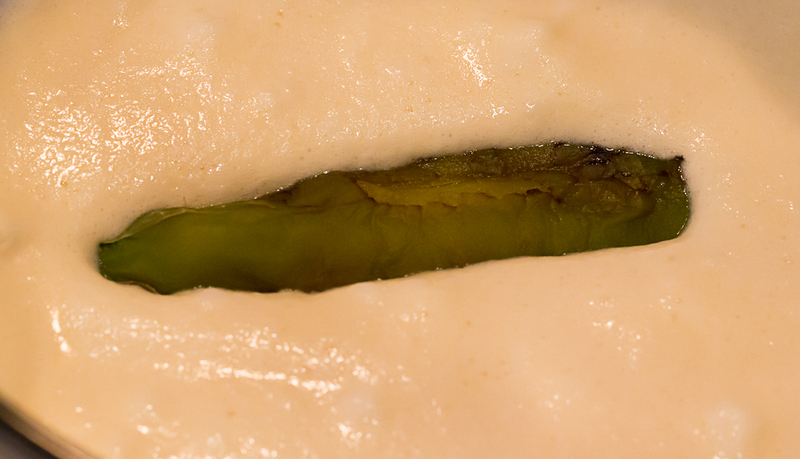 In an oven pre-heated to 400°, melt the butter in a large casserole. Add the minced garlic and rosemary. Add the mushrooms to the melted butter. 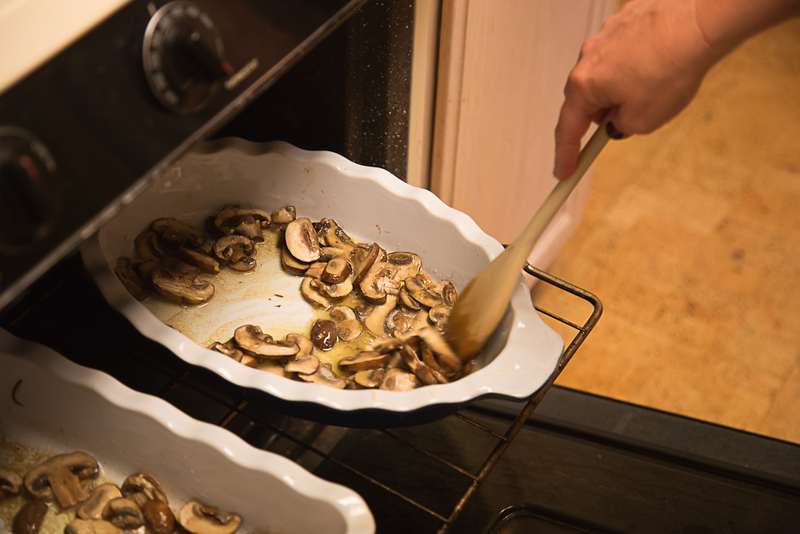 Bake, stirring occasionally, until the mushrooms are cooked through, about 10 minutes. Add the shrimp to the mushrooms and bake, continuing to stir occasionally until the shrimp are pink and have lost their translucency, about 5 minutes. Remove the rosemary, stir in the fresh lemon juice, and correct seasoning with salt and pepper. In the meantime, prepare the couscous according to directions on the box. Serve as a generous helping of couscous topped with the shrimp and mushroom mixture.